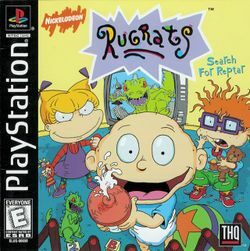 Rugrats: Search for Reptar is an adventure game, that was developed up by N-Space for THQ, and released for the Sony PlayStation on October 31, 1998; as the name suggests, it is the second title in the Rugrats series and the first with multiplayer capability (up to four people can play simultaneously). For those of you who have not seen the show, Reptar was the Godzilla-style Tyrannosaurus Rex who the babies idolised, and his catchphrase was "Halt, I am Reptar" (a robotic version of him, which once saved Tommy and Chuckie from a marauding robotic gorilla named "Thorg", also repeated it when he was activated); in the first Rugrats movie, there was also a car resembling him ("The Reptar Mobile"). This page was last edited on 10 November 2016, at 16:30.